I put empty milk containers back in the fridge. I throw gum wrappers behind the couch. I resist laundry until it smells. I don’t roll the toothpaste tube from the bottom. I eat all of the rice chex out of the Chex Mix. And I use tomato sauce from a jar. Mini meatballs. Bite sized meatballs. Meatballs that can be eaten in one chew. Meatballs that are cute. Meatballs that are easy. Meatballs that are simple. 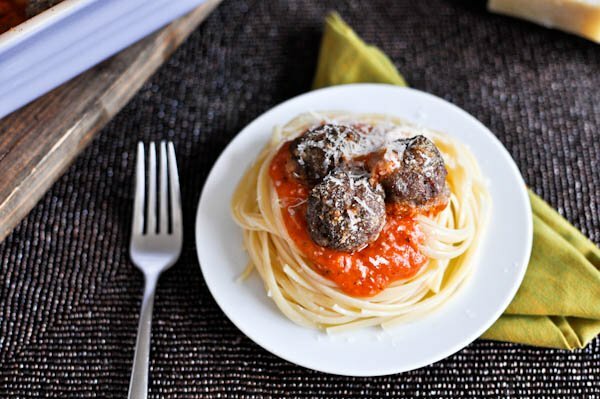 Meatballs that taste delicious with pasta. Meatballs that taste even better snuggled in fluffy wheat buns, toasted to perfection then blanketed with a layer of melty provolone broiled until golden brown. Do it. In a large bowl, add ground beef, egg, oil, cheese, breadcrumbs, garlic, salt, pepper, basil and parsley. Mix to combine, gently tossing a few times with your hands. Don’t overmix – it will result in tough meatballs! Spray a large baking dish with non-stick spray and add 2 cups of pasta sauce. Roll beef into mini meatballs (about a tablespoon of beef) and set in sauce. Once all meatballs have been added, sprinkle additional cheese and breadcrumbs over top. Bake for 20-25 minutes or until meatballs are cooked through. Serve with additional sauce if desired. I also need to add to the above list that I don’t clean. But I believe that goes without saying around here. One Thing My Mom Taught Me.